Creatine is an organic acid that is created naturally by the body, designed to supply energy to the body’s muscle cells through the formation of ATP. It is needed for muscle contraction and also plays a role in muscle growth. Creatine is most abundant in protein-rich foods such as meat and fish, and is also produced by our body, specifically by the kidney, liver, and pancreas. Creatine is commonly available in powder form, which can be mixed with liquids and taken as a dietary supplement that aids the body’s energy production and muscle fiber growth. However, the FDA has not evaluated the safety and effectiveness of creatine supplements. All potential benefits and risks of these supplement remain unknown. In addition, there are no set standards that regulate the production of these compounds. There are different types and forms of creatine supplements sold in the market. Most of these supplements available in the market are in the following forms: creatine monohydrate, phosphate, citrate, ester and malate. Creatine monohydrate is the most widely used and is also the most well studied type of creatine. Creatine supplements usually come in powder form, although it is available in wide variety of forms such as tablets, capsules, liquids, energy bars, fruit-flavored gums, drink mixes, and many other preparations. For healthy, young people, creatine is said to help improve athletic performance and strength, increase lean muscle mass, and hasten muscular recovery during high-intensity exercise. It is also believed to boost muscular capabilities and help athletes gain more speed and energy, especially useful for short, high-intensity activities such as sprinting or weight-lifting. However, it may not be as equally beneficial to highly trained athletes. Contrary to what some people think, creatine does not guarantee increased body mass or muscle strength. Despite reassuring testimonials from countless users, results of scientific studies on creatine are mixed. Although some studies suggest that creatine does help boost athletic performance for short period, more studies are needed to determine whether it indeed improves endurance. In addition, some studies show that not everyone responds to creatine; some people may not actually benefit from it. Recently, studies have indicated that creatine may also be beneficial for those suffering from ALS (Lou Gehrig’s disease), as it sends energy to damaged cells. Once ingested or produced by the body, creatine is stored in the muscles as phosphocreatine. It is then released from muscle tissues during high-intensity physical activities. This substance provides energy for muscle contractions but only for a limited time, making it ideal for growing muscles through resistance training. 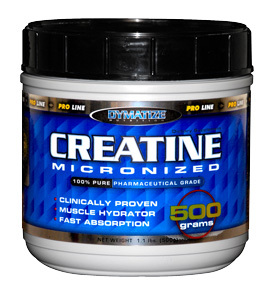 Creatine supplies the muscle with added amino acid that is metabolized during high-intensity exercise. It ‘fuels’ the muscles for more efficient work. Creatine supplements seem to be more beneficial for people who have low creatine levels such as vegetarians. Some studies show that muscle tissues can only store a certain amount of creatine and adding more does not appear to raise the levels. Usually, there is a “saturation point” which is usually reached after few days of increasing creatine intake. Possible Side Effects: Creatine can cause some disturbing side effects such as cramping, diarrhea, nausea, muscle pain, water retention, and high blood pressure. It can also lead to dehydration as such people taking creatine are advised increase fluid intake. Overdose: Consuming more than the allowed dosage can lead to kidney failure and rhabdomyolysis. Interactions: Combining creatine with certain medicines (NSAIDs, diuretics, antiulcer, and antigout drugs) and substances (stimulants such as caffeine and gurana) can cause serious interactions. If you are taking any medications, be sure to talk with your healthcare provider before using creatine supplements. Risks: Since creatine has not been fully evaluated by the FDA, its long-term effects are still unknown. People with kidney or liver impairment are advised not to use creatine. Creatine can likely affect blood sugar levels so people with diabetes are recommended to avoid using it. Since there is not enough data about the safety of creatine, children and pregnant or breastfeeding women should not use this supplement.